T&W Oyster House is located five miles north of the Emerald Isle bridge on Route 58. Our first experience with T&W came this summer when we were still looking for a house in the area. I had been searching for some great oysters and happened to be driving by one day. It seemed logical to me that you would find great oysters at an oyster house. That proved to be the case. Since then we have had a number of fine seafood meals at the T&W Oyster House. In fact Saturday afternoon we were coming back from Jacksonville through Stella, and we happened upon T&W about 4 pm. Since we had skipped lunch, an early dinner sounded pretty good, so we swung into the parking lot. My wife, Glenda, immediately noticed the signs for breakfast. Having breakfast in a restaurant is one of our favorite ways to start the day. That is sometimes a challenge in the Emerald Isle, Cape Carteret, Cedar Point and Swansboro area. If you're late for breakfast, you can end up waiting. The idea of another breakfast spot sounded great to us. We went into T&W and enjoyed a great plate of flounder and shrimp by one of their impressive fireplaces. As we were finishing the meal, we asked the waitress about the Sunday breakfast buffet. It sounded delicious and having our next meal sixteen hours or so later sounded about right considering the amount of flounder and shrimp we put away. This Sunday morning we showed up at T&W's just as they were opening. In fact there were plenty of people already in the restuarant so it took them an extra five minutes or so to finish preparing everything before they opened the buffet. The variety of food spanned the imagination of a breakfast lover. There was everything from scrambled eggs to eggs Benedict, French toast, bacon and sausage. I particularly enjoyed the fluffy biscuits and the spicy sausage gravy which was filled with sausage. It will take more than one trip to do a taste test on all the buffet items. It is a tough job, but we will see what we can do. Randy Swanson, the manager, told us that he will likely open earlier next Sunday due to popular demand. It wouldn't hurt to phone ahead to check the opening time if you want to do the Sunday buffet. Or you could check out the regular breakfast which is available from 6:30 until 10:30 AM during the week. We just might see you there. The buffet is very reasonably priced at $7.50 per person with beverages being extra. 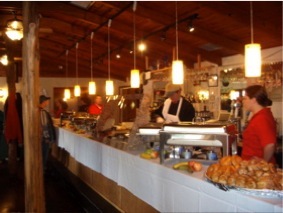 I've eaten at some very fine buffets over the years, including some famous ones like the Homestead and the Greenbrier. While the T&W Oyster Bar certainly isn't as fancy, the breakfaast food will hold its own against plenty of more expensive spots. Their telephone number is 252 393-8838. They are located on the left on Route 58, five miles north of where 58 and 24 intersect.